Translation from The Prose Tales of Alexander Pushkin, London: George Bell and Sons, 1895. We were stationed in the little town of N----. The life of an officer in the army is well known. In the morning, drill and the riding-school; dinner with the Colonel or at a Jewish restaurant; in the evening, punch and cards. In N---- there was not one open house, not a single marriageable girl. We used to meet in each other's rooms, where, except our uniforms, we never saw anything. One civilian only was admitted into our society. He was about 35 years of age, and therefore we looked upon him as an old fellow. His experience gave him great advantage over us, and his habitual taciturnity, stern disposition and caustic tongue produced a deep impression upon our young minds. Some mystery surrounded his existence; he had the appearance of a Russian, although his name was a foreign one. He had formerly served in the Hussars, and with distinction. Nobody knew the cause that had induced him to retire from the service and settle in a wretched little village, where he lived poorly and, at the same time, extravagantly. He always went on foot, and constantly wore a shabby black overcoat, but the officers of our regiment were ever welcome at his table. His dinners, it is true, never consisted of more than two or three dishes, prepared by a retired soldier, but the champagne flowed like water. Nobody knew what his circumstances were, or what his income was, and nobody dared to question him about them. He had a collection of books, consisting chiefly of works on military matters and a few novels. He willingly lent them to us to read, and never asked for them back; on the other hand, he never returned to the owner the books that were lent to him. His principal amusement was shooting with a pistol. The walls of his room were riddled with bullets, and were as full of holes as a honey-comb. A rich collection of pistols was the only luxury in the humble cottage where he lived. The skill which he had acquired with his favourite weapon was simply incredible; and if he had offered to shoot a pear off somebody's forage-cap, not a man in our regiment would have hesitated to place the object upon his head. Orest Kiprensky. Portrait of Alexander Pushkin, 1827. 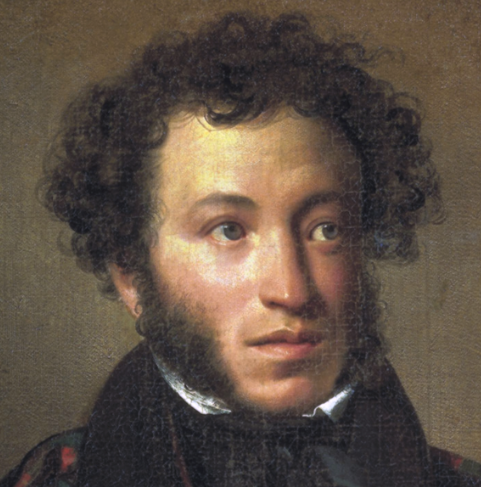 Alexander Sergeyevich Pushkin was a Russian poet, playwright, and novelist of the Romantic era who is considered by many to be the greatest Russian poet and the founder of modern Russian literature. Pushkin was born into Russian nobility in Moscow. One day, about ten of our officers dined with Silvio. They drank as usual, that is to say, a great deal. After dinner we asked our host to hold the bank for a game at faro. For a long time he refused, for he hardly ever played, but at last he ordered cards to be brought, placed half a hundred ducats upon the table, and sat down to deal. We took our places round him, and the play began. It was Silvio's custom to preserve a complete silence when playing. He never disputed, and never entered into explanations. If the punter made a mistake in calculating, he immediately paid him the difference or noted down the surplus. We were acquainted with this habit of his, and we always allowed him to have his own way; but among us on this occasion was an officer who had only recently been transferred to our regiment. During the course of the game, this officer absently scored one point too many. Silvio took the chalk and noted down the correct account according to his usual custom. The officer, thinking that he had made a mistake, began to enter into explanations. Silvio continued dealing in silence. The officer, losing patience, took the brush and rubbed out what he considered was wrong. Silvio took the chalk and corrected the score again. The officer, heated with wine, play, and the laughter of his comrades, considered himself grossly insulted, and in his rage he seized a brass candlestick from the table, and hurled it at Silvio, who barely succeeded in avoiding the missile. We were filled with consternation. I alone could not approach him on the old footing. Being endowed by nature with a romantic imagination, I had become attached more than all the others to the man whose life was an enigma, and who seemed to me the hero of some mysterious drama. He was fond of me; at least, with me alone did he drop his customary sarcastic tone, and converse on different subjects in a simple and unusually agreeable manner. But after this unlucky evening, the thought that his honour had been tarnished, and that the stain had been allowed to remain upon it in accordance with his own wish, was ever present in my mind, and prevented me treating him as before. I was ashamed to look at him. Silvio was too intelligent and experienced not to observe this and guess the cause of it. This seemed to vex him; at least I observed once or twice a desire on his part to enter into an explanation with me, but I avoided such opportunities, and Silvio gave up the attempt. From that time forward I saw him only in the presence of my comrades, and our confidential conversations came to an end. "Gentlemen," said Silvio, "circumstances demand my immediate departure; I leave tonight. I hope that you will not refuse to dine with me for the last time. I shall expect you, too," he added, turning towards me. "I shall expect you without fail." "I was calmly enjoying my reputation, when a young man belonging to a wealthy and distinguished family -- I will not mention his name -- joined our regiment. Never in my life have I met with such a fortunate fellow! Imagine to yourself youth, wit, beauty, unbounded gaiety, the most reckless bravery, a famous name, untold wealth -- imagine all these, and you can form some idea of the effect that he would be sure to produce among us. My supremacy was shaken. Dazzled by my reputation, he began to seek my friendship, but I received him coldly, and without the least regret he held aloof from me. I took a hatred to him. His success in the regiment and in the society of ladies brought me to the verge of despair. I began to seek a quarrel with him; to my epigrams he replied with epigrams which always seemed to me more spontaneous and more cutting than mine, and which were decidedly more amusing, for he joked while I fumed. At last, at a ball given by a Polish landed proprietor, seeing him the object of the attention of all the ladies, and especially of the mistress of the house, with whom I was upon very good terms, I whispered some grossly insulting remark in his ear. He flamed up and gave me a slap in the face. We grasped our swords; the ladies fainted; we were separated; and that same night we set out to fight. "The dawn was just breaking. I was standing at the appointed place with my three seconds. With inexplicable impatience I awaited my opponent. The spring sun rose, and it was already growing hot. I saw him coming in the distance. He was walking on foot, accompanied by one second. We advanced to meet him. He approached, holding his cap filled with black cherries. The seconds measured twelve paces for us. I had to fire first, but my agitation was so great, that I could not depend upon the steadiness of my hand; and in order to give myself time to become calm, I ceded to him the first shot. My adversary would not agree to this. It was decided that we should cast lots. The first number fell to him, the constant favourite of fortune. He took aim, and his bullet went through my cap. It was now my turn. His life at last was in my hands; I looked at him eagerly, endeavouring to detect if only the faintest shadow of uneasiness. But he stood in front of my pistol, picking out the ripest cherries from his cap and spitting out the stones, which flew almost as far as my feet. His indifference annoyed me beyond measure. 'What is the use,' thought I, 'of depriving him of life, when he attaches no value whatever to it?' A malicious thought flashed through my mind. I lowered my pistol. Several years passed, and family circumstances compelled me to settle in the poor little village of M----. Occupied with agricultural pursuits, I ceased not to sigh in secret for my former noisy and careless life. The most difficult thing of all I had to accustom myself to passing the spring and winter evenings in perfect solitude. Until the hour for dinner I managed to pass away the time somehow or other, talking with the bailiff, riding about to inspect the work, or going round to look at the new buildings; but as soon as it began to get dark, I positively did not know what to do with myself. The few books that I had found in the cupboards and storerooms, I already knew by heart. All the stories that my housekeeper Kirilovna could remember, I had heard over and over again. The songs of the peasant women made me feel depressed. I tried drinking spirits, but it made my head ache; and moreover, I confess I was afraid of becoming a drunkard from mere chagrin, that is to say, the saddest kind of drunkard, of which I had seen many examples of in our district. My house was a rich estate belonging to the Countess B----; but nobody lived there except the steward. The Countess had only visited her estate once, in the first year of her married life, and then she had remained there no longer than a month. But in the second spring of my hermitical life, a report was circulated that the Countess, with her husband, was coming to spend the summer on her estate. The report turned out to be true, for they arrived at the beginning of June. A lackey conducted me into the Count's study, and then went to announce me. The spacious apartment was furnished with every possible luxury. Around the walls were cases filled with books and surmounted by bronze busts; over the marble mantelpiece was a large mirror; on the floor was a green cloth covered with carpets. Unaccustomed to luxury in my own poor corner, and not having seen the wealth of other people for a long time, I awaited the appearance of the Count with some little trepidation, as a suppliant from the provinces awaits the arrival of the minister. The door opened, and a handsome-looking man, of about thirty-two years of age, entered the room. The Count approached me with a frank and friendly air: I endeavoured to be self-possessed and began to introduce myself, but he anticipated me. We sat down. His conversation, which was easy and agreeable, soon dissipated my awkward bashfulness; and I was already beginning to recover my usual composure, when the Countess suddenly entered, and I became more confused than ever. She was indeed beautiful. The Count presented me. I wished to appear at ease, but the more I tried to assume an air of unconstraint, the more awkward I felt. They, in order to give me time to recover myself and to become accustomed to my new acquaintances, began to talk to each other, treating me as a good neighbour, and without ceremony. Meanwhile, I walked about the room, examining the books and pictures. I am no judge of pictures, but one of them attracted my attention. It represented some view in Switzerland, but it was not the painting that struck me, but the circumstance that the canvas was shot through by two bullets, one planted just above the other. "Oh!" 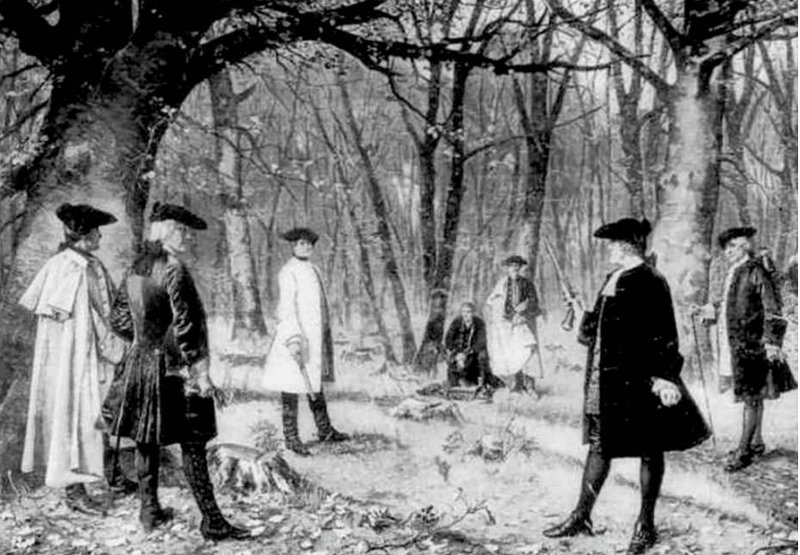 I observed, "in that case, I don't mind laying a wager that Your Excellency will not hit the card at twenty paces: the pistol demands practice every day. I know that from experience. In our regiment I was reckoned one of the best shots. It once happened that I did not touch a pistol for a whole month, as I had sent mine to be mended; and would you believe it, Your Excellency, the first time I began to shoot again, I missed a bottle four times in succession at twenty paces! Our captain, a witty and amusing fellow, happened to be standing by, and he said to me: 'It is evident, my friend, that your hand will not lift itself against the bottle.' No, Your Excellency, you must not neglect to practice, or your hand will soon lose its cunning. The best shot that I ever met used to shoot at least three times every day before dinner. It was as much his custom to do this, as it was to drink his daily glass of brandy."